We're having a meal with a real difference - we're off to South Africa on our culinary cruise! Yes, we're holding what should be a fantastic night out at the Cask & Kitchen in Glossop. The menu sounds really intriguing, with Biltong nibbles on arrival followed by Boerwars (a spiced farmer's sausage) and Pap (cornmeal with a tomato & onion sauce) on skewers to start. For a main course there's bobotie (a fruity Cape Malay curry) or Oxtail Potijie (slow roasted Afrikaans stew). It's just £22 per person - contact our fundraising department to book on 0161 330 7788 or fundraising@willowwood.info. Alternatively, book online now, quickly, easily and securely. 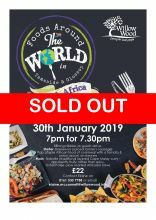 SORRY, THIS EVENT IS NOW SOLD OUT!